Airbus Group Chief Executive Tom Enders speaks during a news conference on the aerospace group's annual results, in London, Britain February 24, 2016. 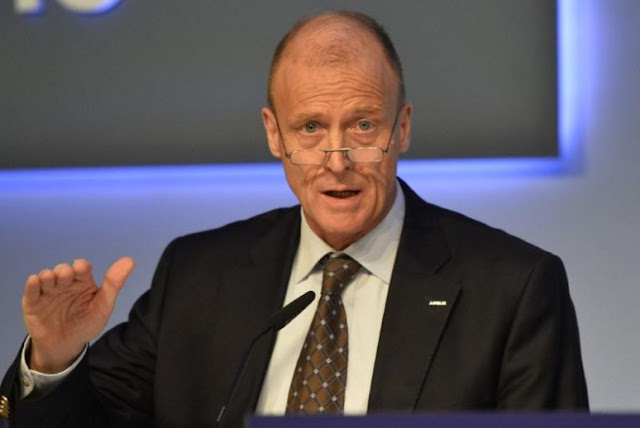 FRANKFURT - Airbus Chief Executive Tom Enders sees no reason to resign over ongoing UK and French corruption investigations, but would be ready to do so if needed, he told a German newspaper. “You can be assured: Once I am no longer part of the solution, and I hope I would realize myself when that is, I will draw the consequences (and step down). But for now, I don’t think we’re at this point,” Enders told Handelsblatt, according to a pre-released version of its Monday edition. Airbus’ board expressed full confidence in Enders on Thursday, but two people familiar with the matter said it only did so after commissioning its own study of top management. The investigations by Britain’s Serious Fraud Office and later its French counterpart were triggered by Airbus in 2016 when it reported itself to UK authorities after uncovering flawed documents over the use of intermediaries in airplane sales. “I do not have any (slush funds) and don’t know of any,” he said, adding that unless the contrary was proven he would assume that no such funds exist at Airbus. Airbus Chief Executive Tom Enders sees no reason to resign over ongoing UK and French corruption investigations, but would be ready to do so if needed, he told a German newspaper. “You can be assured: Once I am no longer part of the solution, and I hope I would realize myself when that is, I will draw the consequences (and step down). But for now, I don’t think we’re at this point,” Enders told Handelsblatt, according to a pre-released version of its Monday edition.